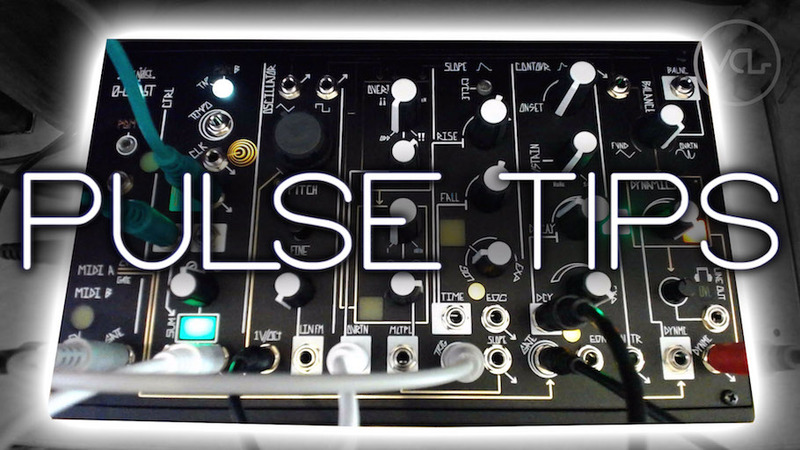 In this week’s Pulse Tips, we are exploring one of the hidden functions of the new Make Noise 0-Coast additive tabletop synth, the alternate MIDI B CV and Gate LFOs. The 0-Coast has some extremely useful MIDI functionality, including a built in arpeggiator, legato mode and velocity and mod wheel mapping. However if you are not using MIDI, the device can switch the MIDI B CV and Gate outputs to send triangle and square wave LFOs, respectively. While the synth already has a number of modulation sources, the LFOs provide additional options for expression, and make rhythmic and drone sounds more attainable and interesting. Accessing the LFOs is easy. Enable the PGM mode by holding the PGM A button down until the PGM A light illuminates. The PGM mode switches to page 1, which controls the arpeggiator. Hit the PGM A button 3 more times to advance to page 4, the MIDI B CV Source page, indicated by the illuminated PGM A light and the red, pulsing MIDI B light. Toggle between functions using the PGM B button, until the PGM B light is flashing rapidly, indicating the triangle LFO is enabled. Pressing the PGM A button again will take you to page 5, the MIDI B Gate Source page. Use PGM B again, toggling until the light is flashing rapidly. For more information, consult the PGM Pages section of the 0-Coast manual. The Make Noise 0-Coast has been making noise in the modular community since NAMM, earlier this year. The semi-modular, single voice tabletop synth is a departure from the standard Make Noise fare. Combining elements of classic East and West Coast synthesis techniques, the instrument has a unique sound and flavor compared to other hardware and semi-modular synths. Housed in an elegantly designed matte black case, the device is less than an inch thick. While compatible with Eurorack modules via the CV routing, the device is not mountable in a Eurorack case. In other news, we have a new video series focused around creating musical examples (sometimes called “tracks”…) of the patches we demonstrate in our tutorials. Our Patch Notes series will serve as an opportunity to explore the limits of certain routings, document them in the video descriptions and provide some creative output beyond the background music in our other material. Here’s the first example, recorded using the routing from our previous tutorial video on Euclidean Rhythms with the Ornament & Crime. We will have an example for today’s 0-Coast video in the coming days! What would you like to see us cover on the 0-Coast? Let us know in the comments! Thx so much for this video. I was considering an O-Coast, but can now save my money as I hate menu diving. This little thing is needlessly complicated. It’s actually not complicated! There are no menus, simply some set and forget program pages which you don’t really need to touch. Pretty much everything is right on the panel. Agreed, I’ve spent hours playing with mine since I got it a few days ago and not even used these LFOs yet. I am kind of confused though… can I not use these LFOs with the MIDI jack inserted?